Malnutrition, anemia and increased atherosclerosis are the main causes of mortality in hemodialysis patients. Therapies designed to improve the disorders might therefore be expected to improve outcome. The effects of Nandrolone Decanoate (ND), in 64 stable hemodialysis patients, were studied with respect to the following parameters: nutritional status, hematological indexes, lipid profiles including serum levels of lipoprotein(a) [Lp(a)] in terms of differences in apolipoprotein(a) [apo(a)]. The patients were treated with ND at dose of 100 mg/I.M./week for 4 months. After 2 and 4 months of treatment the elevations in the serum levels of albumin (p < 0.0001), creatinine (p < 0.009), hemoglobin (p < 0.03), hematocrit (p < 0.03), cholesterol (p = 0.007) and triglyceride (p < 0.04) were noticed. Marked decrease in the concentration of high-density lipoprotein cholesterol (p = 0.007) and Lp(a) (p < 0.0001) were also found. These effects after 2 months of treatment withdrawal were relatively constant. By dividing patients according to the baseline Lp(a) levels and molecular weight of apo(a) isoform, it was noticed that the decrease in serum Lp(a) was significant in patients with high Lp(a) (>30 mg/dl) than those of with low Lp(a) (<30 mg/dl), irrespective of apo(a) molecular weight. It may be suggested that, ND has beneficial effect on nutritional status and treatment of anemia in hemodialysis patients. In spite the adverse effect of ND on lipid profile, it decreases Lp(a) mostly in patients with high serum Lp(a) preferently by the effect on apo(a) gene transcriptional activity. It is well-recognized that in chronic hemodialysis patients the rate of mortality is higher than that of general population [1, 2]. The cause of discrepancy is probably multifactorial, but malnutrition, anemia, hypoalbuminemia, reduced muscle mass and increased atherosclerosis are common in dialysis patients [1–3]. Therapies designed to improve the nutritional status, control of anemia and atherosclerosis of hemodialysis patients might therefore be expected to improve outcome [2, 4]. Anabolic agents, such as human growth hormone (HuGH) can improve nitrogen balance, reduces urea generation and protein catabolic rate in long term hemodialysis patients. However HuGH is expensive, can exacerbate hyperglycemia and may have a limited potential role as a long-term treatment for anabolism . The anemia of renal failure responses, directly to treatment with erythropoietin . Because of the relatively high cost of recombinant human erythropoietin, the use of Nandrolone Decanoate (ND) a non-17alpha-alkylated androgen has been suggested instead of the above mentioned hormone [2, 6]. Many studies have shown that ND not only increased RBC production, but also prolonged RBC survival . In spite that the drug is associated with high incidence of adverse effects including acne, virilization, abnormal liver function, discomfort from intramuscular injection , It can increase weight, triceps skinfold thickness, nitrogen balance and bone mineral density [2, 7]. Moreover a reduction in the level of atherogenic lipoprotein (a) [Lp(a)] particles following ND administration to hemodialysis patients has been described . Lp(a) is an important independent risk factor for atherosclerotic cardiovascular disease in general population as well as in hemodialysis patients [8–10]. The lipoprotein contributes at least partially to the increased cardiovascular risk seen in patients with renal failure . Therefore it is clinically important to reduce high serum Lp(a) by intervention [12–14]. Lp(a) is a low-density lipoprotein particle in which apolipoprotein B-100 (apo B-100) linked by a single interchain disulfide bridge to a unique glycoprotein apolipoprotein(a) [apo(a)] . In contrast to apo B-100, which remain relatively constant in molecular weight, apo(a), under genetic control, ranges between 300 and 800 KD [15–17]. Utermann et al. detected 6 polymorphs with different in sizes and a null variant of apo(a) . The size of the apo(a) phenotypes F, B, S1, S2, S3 and S4 were inversely associated to plasma concentrations of Lp(a) and family studies showed that a series of autosomal alleles at one locus are involved in determining both apo(a) size and Lp(a) concentration [19, 20]. It is now demonstrated that plasma levels of Lp(a) are controlled by synthesis rather than by catabolism [21, 22]. There are limited data on how diet and drugs effect plasma Lp(a) levels . The purpose of this study was to analyze the effect of ND on nutritional status, hematological parameters, lipid profiles and serum levels of Lp(a) in terms of differences in apo(a) isoforms in patients on hemodialysis. We studied 70 Iranian patients under maintenance hemodialysis between Jun 2002 and Dec 2003. Malnutrition, active hepatitis and benign prostatic hypertrophy (in males) were among the exclusion criteria. Six patients were lost to follow-up (3 died from cardiac arrest, 2 received kidney transplant and 1 for abnormal liver function). Sixty four patients (47 male and 17 female), mean age of 63 ± 12 years completed the study period. The etiology of end-stage renal disease was diabetic nephropathy (n = 10), chronic glomerulonephritis (n = 17), polycystic disease (n = 5), urological problems (n = 5), chronic interstitial nephropathy (n = 4) and unknown (n = 23). All the patients underwent hemodialysis (4 hours) two to three times per week using cellulosic membrane. The dialysis schedule was not modified during period of the study. After taking of informed consent from the patients, ND 100 mg/I.M. was given weekly for 4 months. Before hemodialysis sessions fasting venous blood samples were collected before the start of ND treatment, at 2, 4 months during the treatment and 2 months after withdrawing of treatment. Hemoglobin (Hb) and hematocrit (Hct) were measured by cell counter, and serum levels of total cholesterol (C), triglyceride (TG), high – density lipoprotein cholesterol (HDL-C), albumin (Alb) and creatinine (Cr) in the collected samples were determined by using commercial reagents (Randox) in an automated chemical analyzer (Cobas Mira). The serum levels of Lp(a) were assayed by commercially available immunoturbidimetric kit using the same analyzer. The apo(a) phenotypes were determined by sodium dodecyl sulfate-polyacrylamide / agarose gel electrophoresis and immunoblotting with monoclonal apo(a) antibodies [24, 25]. Apo(a) isoform sizes were determined by comparison of their sizes with an apo(a) standard (Immuno-AG) electrophoresed on each gel which contained 5 different isoforms. Low molecular weight (LMW) apo(a) phenotypes included all subjects who had at least one of the isoforms F, B, S1 or S2, whereas the high molecular weight (HMW) apo(a) phenotypes included all subjects with only S3 or S4 isoforms or with null type [21, 25, 26]. SPSS 11 for window program was used to perform statistical analysis by computer. Results are expressed as mean ± SD. Paired t-test and wilcoxon signed ranks test as appropriate were used to assess significancy of differences between base and 2 months after withdrawing treatment. Comparisons analysis between base, two and post of treatment values were performed using multiple comparison in one-way ANOVA and Friedman tests. All correlation were evaluated by liner regression and the statistical significance was set at p < 0.05. The changes in serum levels of Alb, Cr, C, TG, HDL-C and Lp(a) and blood concentration of Hb and Hct following 2 and 4 months treatment with ND are shown in Table 1. Serum levels of Alb and Cr were determined to assess the effect of treatment on the nutritional status. After 2 and 4 months treatment significant elevation in the serum levels of the both parameters was noticed (p < 0.0001 and p < 0.009 respectively). Marked increase of Hb and Hct, without increasing of erythropoietin dose, was also found after 2 and 4 months treatment (p < 0.03 in all the cases). The effect of ND on the lipid profile was evaluated by measuring serum levels of C, TG and HDL-C in samples collected before and two and four months after the treatment. Marked increase in the mean ± SD levels of C (P = 0.007), TG (p < 0.04) and significant decrease in the concentration of HDL-C (P = 0.007) was detected in all the samples obtained after the treatment. Serum Lp(a) concentration before the start of ND treatment was 40.6 ± 24.2 mg/dl and reduced to 33.1 ± 19.2 mg/dl and 31.3 ± 17.2 mg/dl after 2 and 4 months of treatment with ND respectively (p < 0.0001). To certain the effect of ND on the above parameters after 2 months of treatment withdrawal, evaluation of the above parameters was repeated. As shown in Table 1, reduction of the previously elevated C and increased the concentration of the previously reduced HDL-C was noticed, although they did not reach to the baseline and C was significantly higher and HDL-C was still significantly lower than the basal values (p < 0.0001 and p = 0.004 respectively). Although TG was decreased after ND withdrawal, as compared after ND therapy, no meaningful changes comparing with basal value was detected (p = 0.085). Reduction was also noticed in the both of Hb concentration and Hct (p = 0.001 in all the cases) and also those of Alb and Cr (p = 0.001 and p = 0.008 respectively), but still all of them were maintained higher than those of basal values. The mean ± SD levels of Lp(a) after withdrawal of ND treatment slightly increased from 31.3 ± 17.2 mg/dl to 33.3 ± 21.8 mg/dl. However, Lp(a) concentration still was significantly lower than that of basal value (p < 0.0001). To determine the suppressive effect of ND on serum levels of Lp(a) according to the baseline Lp(a) levels and the molecular weight of apo(a) isoforms, after 4 months treatment, the patients were divided into two groups according their basal Lp(a) levels [13, 27]: less than and higher than 30 mg/dl groups, and the mean ± SD values of reduction in the each group were categorized in the following four patients groups: high Lp(a) with HMW phenotypes (n = 15), high Lp(a) with LMW phenotypes (n = 22), low Lp(a) with HMW phenotypes (n = 20) and low Lp(a) with LMW phenotypes (n = 7). 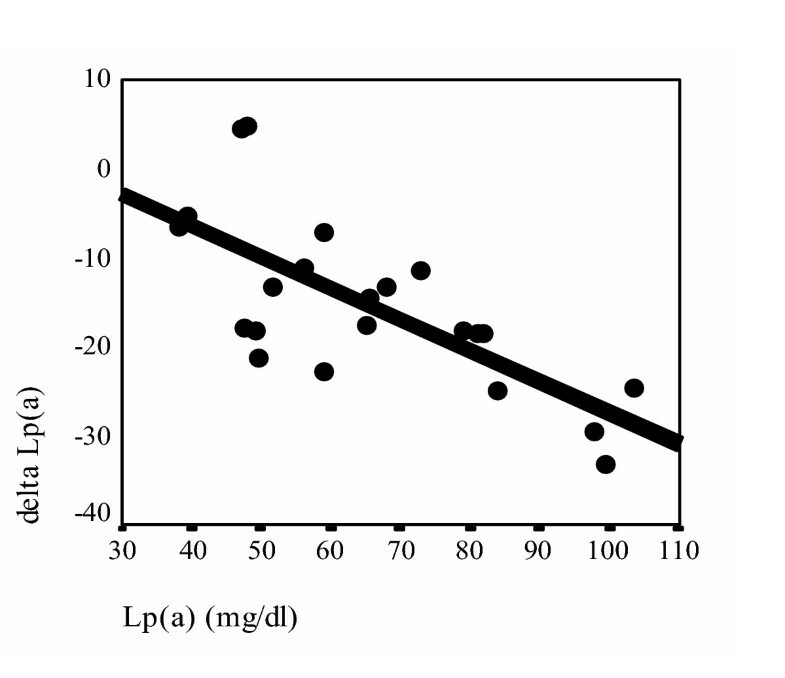 As are represented in Table 2 significant decrease in Lp(a) concentration was observed in the high Lp(a) with HMW and, high Lp(a) with LMW groups (p = 0.001 and p < 0.0001 respectively). The decrease in Lp(a) levels in the other two groups were not marked (p > 0.1 and p > 0.2 respectively). The correlation between the baseline Lp(a) levels and the degree of decreased Lp(a) after 4 months of ND treatment [delta Lp(a)] in patients with high serum Lp(a) concentration according to apo(a) molecular weight were analyzed in the patients with high serum Lp(a) concentration. 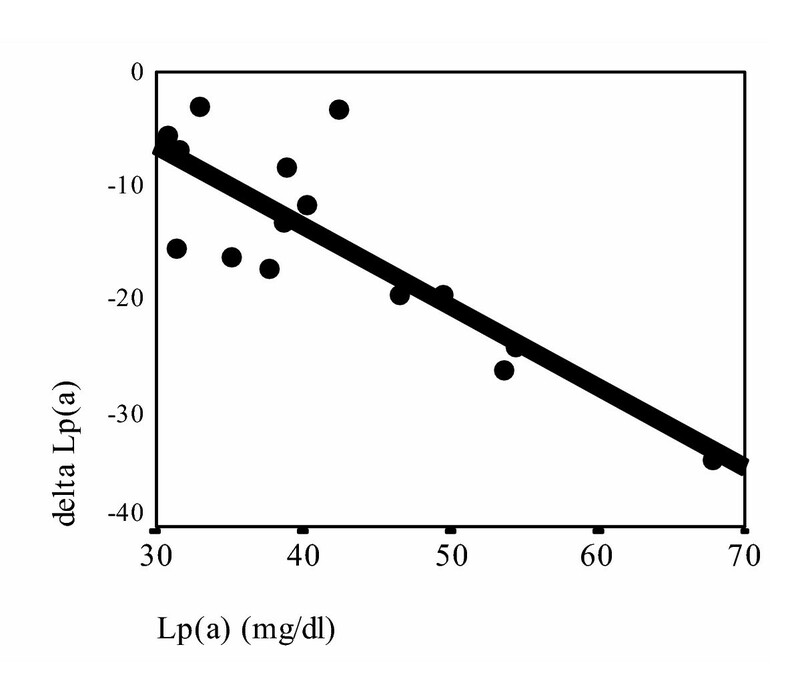 Interestingly significant correlation in both high Lp(a) with HMW phenotypes (r = 0.832, p < 0.01) (fig. 1) and high Lp(a) with LMW phenotypes (r = 0.713, p < 0.01) patients groups were noticed (fig. 2). Changes of nutritional, hematological and lipid profile before the start of ND treatment, at, 2, 4 months during the treatment and 2 months after withdrawing treatment in 64 hemodialysis patients. *, Comparison analysis between base, two and post of treatment values were performed using multiple comparisons by one-way ANOVA. **, Paired t-test was used to assess significancy of differences between base and 2 months after withdrawing treatment. ***, Comparison analysis between base, two and post of treatment values were performed using Friedman test. ****, Wilcoxon signed ranks test was used to assess significancy of differences between the base and 2 months after withdrawing of treatment. Effect of ND treatment on serum Lp(a) according to basal Lp(a) concentration and molecular weight of associated apo(a) isoforms. *, Wilcoxon signed ranks test. There are limited data on how diet and drugs affect plasma Lp(a) levels. Lp(a) levels are unaffected by lipid lowering dietary treatment, and are even increased by dietary trans fatty acids [23, 28, 29]. Furthermore, the Lp(a) serum level is unaffected by most lipid – lowering drugs [23, 30–32]. Neither treatment with HMG-CoA reductase inhibitors, nor fibrate drugs have resulted in significant lowering of Lp(a) levels . In the present study the effect of ND therapy on nutritional status, hematological parameters and lipid profiles with emphasis on Lp(a) were evaluated in 64 stable hemodialysis patients. Malnutrition is a highly prevalent and clinically significant problem in chronic hemodialysis patients. It has been reported that low levels of Alb and Cr were associated with a significantly greater risk of hemodialysis patients' mortality. Therefore therapeutic agents which increase Alb and Cr levels may decrease mortality in these patients [1, 2]. Many studies have shown that treatment with ND resulted in significant increase in serum Alb and Cr levels [1, 7]. We also observed that treatment with ND increases the concentrations of the Alb and Cr and after the androgen withdrawal, levels of the parameters maintained at levels higher than the basal values at before of treatment. The findings suggest that ND treatment has beneficial effects on nutritional status in hemodialysis patients. It has been suggested that administration of androgen also has beneficial effect on erythropoiesis in patients on regular hemodialysis [2, 5–7, 34, 35]. We analyzed the effect of ND on hematological factors in hemodialysis patients. Hb and Hct values raised significantly with respect to basal values during the study although dose of the recombinant human erythropoietin were not changed during the therapy with ND. Moreover after discontinuing use of the ND, levels of both parameters decreased slightly, but their levels still significantly were higher than basal values. Our results suggest that ND can be used successfully in the treatment of anemia in hemodialysis patients. Many studies concluded that androgen therapy is associated with high incidence of adverse effect in lipid profiles [4, 5, 34] while others have shown that ND has no marked effect on the lipid profile . In this study evaluating the effect of the drug on lipid profiles showed significantly increase in C and marked decrease in HDL-C levels, without significant changes in TG level. Although after withdrawal ND therapy the levels of C decreased and that of HDL-C increased, but the levels of both parameters were still significantly different from those of the basal values. The data confirm the finding of the others that, treatment with ND is associated with adverse effect on serum lipid profiles [4, 34]. We believe that the accompanying of lipid lowering agents during ND administration in hemodialysis patients maybe clinically useful and deserves another study. In our investigation significant reduction in the levels of Lp(a) in hemodialysis patients after 4 months treatment with ND was observed. Lp(a) is largely genetically determined by the rate of production of apo(a) and the protein levels mostly controlled by both synthesis and secretion [36–40]. The synthesis of apo(a) depends on the expression of apo(a) mRNA in hepatocytes, which is regulated by transcriptional activity of the apo(a) gene. The secretion of apo(a) by hepatocytes in turns is affected by the molecular weight of the apo(a) isoforms [41, 42]. For comparing the transcriptional activity of the apo(a) gene in term of apo(a) molecular weight, all patients were classified into the following four groups: 1-high Lp(a) concentration with HMW isoforms. 2-high Lp(a) concentration with LMW isoforms. 3-low Lp(a) concentration with HMW isoforms. 4-low Lp(a) concentration with LMW isoforms . Because groups with high Lp(a) concentration have higher transcriptional activity than groups with low Lp(a) levels in same molecular weight isoforms, it is conceivable that, group 1 has a higher transcriptional activity than group 3, and group 2 has higher transcriptional activity than group 4 . Results have shown that ND lowered serum Lp(a) concentration more effectively in patients with high Lp(a) in both HMW and LMW isoforms (group 1, 2), and the decreased values for serum Lp(a) are correlated with the pre-treatment (basal levels) of serum Lp(a) in both groups. Because it was established that, the secretory efficiencies of apo(a) in the same molecular weight isoforms are likely to be similar , a different in Lp(a) reduction in the same molecular weight isoforms (group 1, 3 and group 2, 4) would represent a different in transcriptional activity of apo(a) gene. Therefore it may be suggested that, ND lowers serum Lp(a) concentration preferentially in patients with high serum Lp(a) levels by effect on apo(a) gene transcription rather than effect on secretory efficiency of apo(a) in hemodialysis patients. In conclusion, ND administration has beneficial effects on nutritional status and treatment of anemia in hemodialysis patients. In spite of the fact that the drug has adverse effect on the lipid profiles, it reduces the level of Lp(a) mostly in patients with high Lp(a) levels irrespective of apo(a) isoform size. Further studies in a large number of patients are needed to confirm this hypothesis.